We (Rolf and I) decided to quit Blaze, and quit writing for Addybook. This caused quite a stir in Blaze and eventually Oxyron took over Addybook (and Blaze). As a token of comradeship I agreed to write one final time for this new issue now released under the banner of Oxyron. I reviewed c64 music for our diskmag. 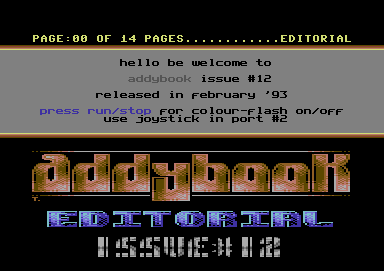 Addybook 10 was the new and improved continuation of our diskmag. After the summerbreak in 1992, a new layout and UI was completed. I reviewed c64 tunes. Addybook 9 was the last one we did before the summerbreak in 1992, and we would get a new look ready for the next issue after the summerbreak. I reviewed c64 tunes. 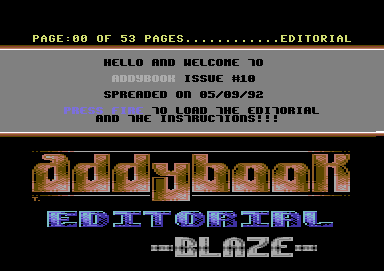 Addybook 8, while I was in the German diskmagazine group Blaze I wrote music (c64) reviews for our mag. 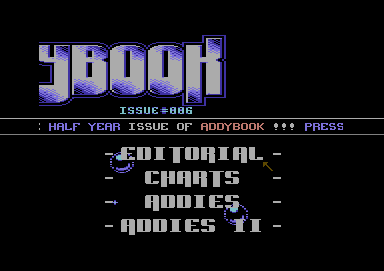 Addybook 7 where I reviewed several C64 tunes sent to me. Addybook 6 was where we first had our music chapters. I would review Commodore 64 tunes that were send to me by composers for Addybook review. When Rolf and I joined Blaze to work as editors for their diskmagazine Addybook, this was the first issue we worked on. Also got two tunes done by me, music 8 and music 5. You are currently browsing the archives for the Text category.